The winners of the South Asian Basketball Association (SABA) Championship will qualify for the FIBA Asia Cup taking place in Lebanon in August this year. The winner also ensures qualification for its country’s top club team in the FIBA Asia Champions Cup – a tournament where the premier club teams of Asian countries go head to head. India are defending champions and favourites looking to complete a five-peat. Bangladesh and Sri Lanka are the biggest threats to India’s five-peat. The tournament will be played in a round robin league format. The Indian squad includes 3 debutants under the age of 22 along with savvy veterans. India’s first match will be against host Maldives on May 19th. The training camp for the selection of the team was held at the Indira Gandhi Stadium, New Delhi from 1-17 May. Bengaluru, 18th May 2017: The 5th South Asian Basketball Association (SABA) Championship 2017 will be held from 19th to 23rd May, 2017 in Male, Maldives. The five-day competition is being played in a round robin league format. Defending champions India will look to complete a five-peat but need be wary of Sri Lanka and Bangladesh, who pose the biggest threat to India’s attempt of accomplishing a rare sporting milestone. 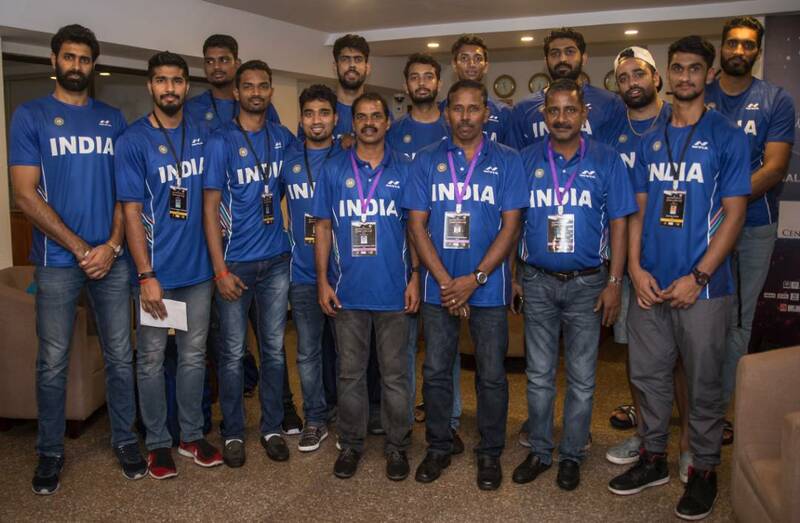 India’s training camp for the tournament was held from 1st-17th May, at the Indira Gandhi Indoor Stadium, New Delhi with 33 players, and the final selections were made on 7th May. A conscious effort was made by the selectors and Head Coach Baskar Sappaniambalam to ensure that the right blend of youth and experience was picked for their campaign in Maldives. “India has had a solid record at the SABA Championship and we aim to continue that trend. It is the only tournament where we can provide an opportunity to our younger players and hence we have selected 3 players under the age of 22. Our main aim is to win and qualify for the FIBA Asia Cup taking place in Lebanon in August,” said Sappaniambalam. India’s attempt at a five-peat of the tournament will be led by experienced point guard Akilan Pari. “Our motto as a team is to win big and make sure that the juniors of our team get playing time. This championship is important for them to get good exposure and will be crucial in their development as players,” says Pari, who made his debut for India in this very tournament four years ago. Also featuring in the squad are centre Amritpal Singh, guard Vishesh Bhriguvanshi and veteran forward Yadwinder Singh. The same trio recently attended the NBL Draft Combine in Melbourne, Australia. Other familiar faces are centre Rikin Pethani, forward Prasanna Venkatesh, shooting guard Arjun Singh, centre Ravi Bhardwaj and forward Anil Kumar BK. Among senior team debutants are promising guard, Vishal Kumar Gupta (Delhi), the talented forward Muin Bek (Tamil Nadu) and centre Jeevanatham Pandi (Tamil Nadu). The trio will be hoping for valuable minutes. As can be gleaned from past SABA editions (see below), the Indian men’s team, with a blend of youth and experience, will start off yet again as strong favourites. The key to its showing will continue to be its superior size advantage when compared to its traditionally smaller South Asian opponent teams. The Championship is played in a round robin format and the team with the best record at the end of this championship will progress from the South Asian region to the FIBA Asia Cup scheduled for 17th to 27th August in Beirut, Lebanon. A round robin format is when each team will face every other team in the tournament once, and the final standings will be based on win/loss statistics.